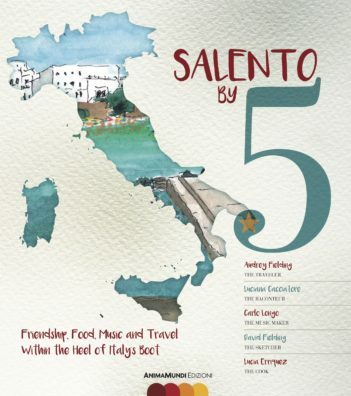 SALENTO BY 5 is an indispensable read whether you are merely curious or planning a trip to Southern Italy’s Salento region–located in the province of Puglia at the tip of the heel of the boot. Five authors, two repeat travelers to the area and three Salentinian locals with whom they developed a close friendship, offer travel tips and personal stories about Salento and its relatively unknown yet unforgettable charms. In addition to valuable travel advice from those who know their own homeland, the Italians write about their family history, the land, the music and, of course, the food of the area. The book is a travel memoir and Salento Love Fest filled with information and personal observations about the region. Sprinkled throughout the book are drawings and watercolors, contributed by one of the authors, that delightfully depict the sea, the ancient towns, the olive trees, and more.